1. Paint Something a bold colour. I recommend pink or yellow! An old chair or stool requires no commitment, is cheap, easy to change, and gives an instant lift. 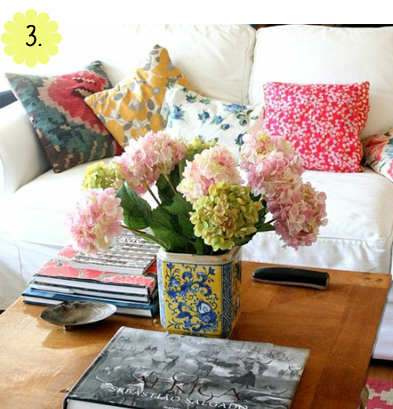 I'm talking drapes & pillows - things that are easy to switch out, and make a big difference. 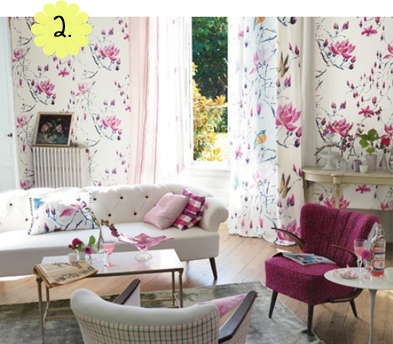 Designer's Guild new collection includes these beautiful spring prints. I feel all fresh and springly just looking at them. It goes without saying that one of the cheapest and fastest facelifts for a room are flowers... and flowers in a fun vase = 10x better. 4. Let there be white! Nothing is crisper than white walls and trims. 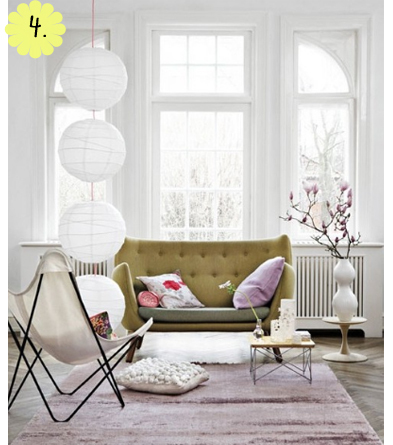 A slick of white paint over a beige wall will change the room drastically. It enlarges the space AND gives it the appearance of being more open. Sweet deal. It might still be a bit chilly for sitting on the patio but this is the time to cultivate houseplants and grow some greenery inside. ... now that I've written a post about Spring, guess where I am? ...or more specifically, the country in the South Pacific closest to Antartica..
...or MORE specifically, curled up in bed listening to the torrential downpour that is battering our little house and being EXTREMELY grateful that I'm not out there this morning. And that I'm here instead, waiting for husband to cook breakfast and bring it to me. Literally. My point was that it's not Spring here... not even close.. we're heading for the depths of WINTER and these Springy tips are keeping me from going insane. Luckily Winter is a good excuse for snuggly fixes which we are using in a big way around here! Oh, I love that first picture. That pop of pink is just amazing! 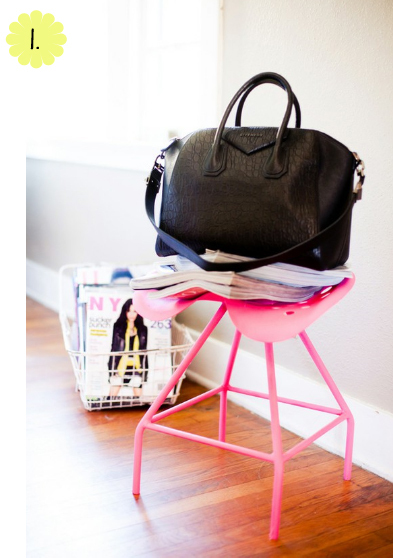 I really really want that hot pink stool! ahhh.